The latest device to run into some trouble is the Apple Watch. And ironically, a device that Apple is counting on to support its health platform is running into difficulties in hospitals of all places. Apparently, there is some equipment used in the ICU that is causing the Apple Watch to reboot unexpectedly. ICUs are often full of telemetry equipment which could explain the issue with the Apple Watch Series 3 with and without cellular. A nurse who works in a hospital was presented with an Apple Watch Series 3 for Christmas by her husband. But her smartwatch started rebooting every 60 to 90 minutes when she was in the vicinity of the ICU. She had her Apple Watch replaced, but the same exact problem continued to happen. In fact, an Apple Support thread complaining about the same issue has several replies from Apple Watch Series 3 wearers experiencing the same problem inside a hospital. 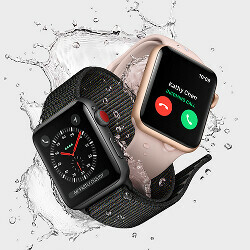 Apple previously said that "a "pacemaker, defibrillator, or any other medical device" could be affected by "Apple Watch components and radios that emit electromagnetic fields." However, you'll note that this really doesn't say anything about the Apple Watch getting affected by hospital equipment. One solution that some are trying is to run the Apple Watch on airplane mode while inside a hospital. Doing this, however, will prevent the device from connecting to the internet or a paired iPhone. That's just Apple secretly reducing the CPU speed of the Apple watches. Move along here, nothing to see. That's what Apple wants you to see. Awww, don’t worry we will push out update to fixed it, slow down your watch CPU by 60% problem solve. Or you can just go out get a new one. That's a feature which requires a few bucks to switch off. yeah how much? Model	Out-of-warranty battery service	Out-of-warranty service fee Apple Watch Sport	$79	$199 Apple Watch	$79	$249 Apple Watch Hermès	$79	$249 Apple Watch Edition	$79	$2,800 you tell me. Someone gonna denied the truth as kiddo again. There's definitely something going on with all the reboots and battery issues lately, and I'm not singling out apple by any means...all OEM's are questionable if using the old lithium standard. We're ready for an upgrade in battery tech. I have the Nike sport loop series 3 with cellular, and so far it works fine. I was having an issue receiving notifications on both watch and phone at the same time, but I turned off wrist detection and that fixed it. It works perfectly fine now. I went on Apple forums, and saw that quite a few were having notifications issues, while wrist detection was on. Not sure what causes it, but it’s all good now. I can’t speak on the hospital thing, but I had surgery on my eye a few weeks ago, and noticed no issues with reboots. What Apple device you don’t have? I’m an tech fan/Apple product user. You’re an Apple troll...big difference. You think in the Apple box. I think out the Apple box...big difference. You’re blind. I have sight...big difference. Aren't devices required not to interfere with the function of other devices by law in the US? Apple should make it blatantly clear that their watches should not be used in hospitals. The Apple watch interfering with medical equipment is an extremely serious issue. Can a series 2 connect with phone and still use AirPods same time for calls?